Transparency Market Research provides key insights on the global latex-saturated paper market in its newly published report, “Latex-saturated paper market: Global Industry Analysis, Size, Share, Growth, Trends, and Forecast, 2019-2027.” In terms of value, the global latex-saturated paper market is projected to clock a CAGR of 4.3% during 2019-2027. This is due to several factors about which, TMR provides key insights and forecast. Request A Sample - https://www.transparencymarketresearch.com/sample/sample.php?flag=S&rep_id=54201? Latex-saturated paper is widely used for promotional purposes across the globe. High durability and printable nature of latex-saturated paper enables it to be used for any promotional application. The high preference for latex-saturated paper is more prominent in trade shows and fairs where banner stands and table-top displays play a key role in consumer engagement. In today’s context, having graphics media with varying finishes, compositions, and printer capabilities is pivotal to the success of any trade show in its ability to appeal to visitors. Therefore, latex-saturated paper is one of the highly preferred solutions for brands requiring sing and banner supplies. There are some associated factors which can potentially hamper the growth of the latex-saturated paper market. These include the usage of alternative products such as plastic signages or digital displays. According to a survey conducted by Transparency Market Research which involved over 50 retail brands and well over 200 consumers, more than 60% of the brands accepted registering increased sales from the adoption of digital signages and promotional media. Moreover, out of all the consumers surveyed, more than 80% believed that digital media was better able to create brand awareness. This could potentially cause hampered growth rates for the global latex-saturated paper market. In terms of quantity of information, digital signages are better able to spread more information per signage, which can also be seamlessly updated with a few clicks, unlike those using latex-saturated paper. Furthermore, latex-saturated paper is used instead of copier and office paper. Due to higher cost of latex-saturated paper, copier papers ends up being used in most workplaces. The Asia Pacific latex-saturated paper market is expected to represent significant revenue growth opportunity during the next eight years. Growth in packaging applications is expected to be a significant contributor to increase revenues in the Asia-Pacific latex-saturated paper market during the forecast period. Although the growth of digitalization in developing countries is in double-digits, an increase in the number of brick-and-mortar stores means more scope for the use of latex-saturated paper in posters and signages, as brands explore new ways to engage the well-informed modern consumer. Manufacturers of latex-saturated paper are thus more likely to pursue rightsizing of their supply chains in order to accommodate high growth countries in the Asia Pacific region in their area of coverage. Also, applications such as veneer backing and wallcovering using latex-saturated paper are expected to witness lucrative opportunities for growth in Asia Pacific countries during 2019-2027. The surge in demand for latex-saturated paper is expected to be fuelled primarily by the increasing disposable incomes and per-capita spending power of upper middle class families. The TMR report includes a detailed competition landscape, which includes profiles and assessment of key players operating in the global latex-saturated paper market. 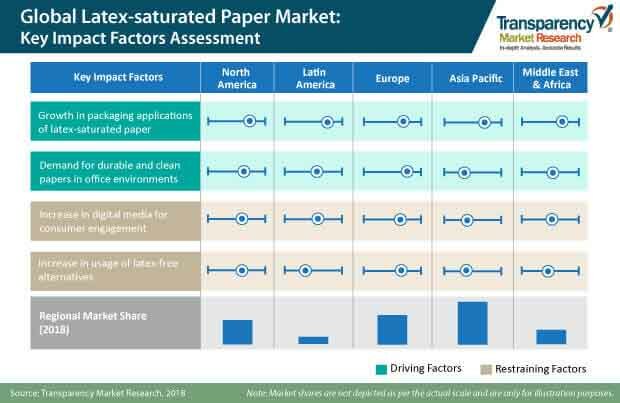 The key manufacturers of latex-saturated paper profiled include – Potsdam Specialty Paper, Inc., Nar SpA, Neenah Inc., Mask-Off Company Inc., EMI Specialty Papers, Inc., Mafcote, Inc., Paperfabriek Schut B.V., UPM-Kymmene Oyj, The Griff Network, Daifuku Paper Mfg. Co., Ltd., Sihl AG, Laufenberg GmbH, and Ecological Fibers, Inc.